The Sense 3D scanner is one of the most affordable full color 3D scanners available out there, so it is no wonder a lot of people are looking at the device as their first 3D scanner to go along with the 3D printer they already have. We too decided to give it a try and get a Sense to try out as our first 3D scanner, even though we already knew that we should not expect too much from the device or from any other affordable 3D scanner for that matter. We have already researched other products that go at up to about 2000 USD and all of the devices up to that price range are far from providing great results, nevertheless with a price of just $399 USD the Sense 3D scanner is really attractive at least from a price point of view. The Sense 3D scanner is a hand held model that can be used to scan not only small models, but also larger ones including people. It is designed to support scan volume from 0.2×0.2×0.2m up to 3x3x3m with an operating rage from 0.35m to 3m. The depth resolution of the device at 0.5 meters is 1mm and the spatial x/y resolution is 0.9mm. 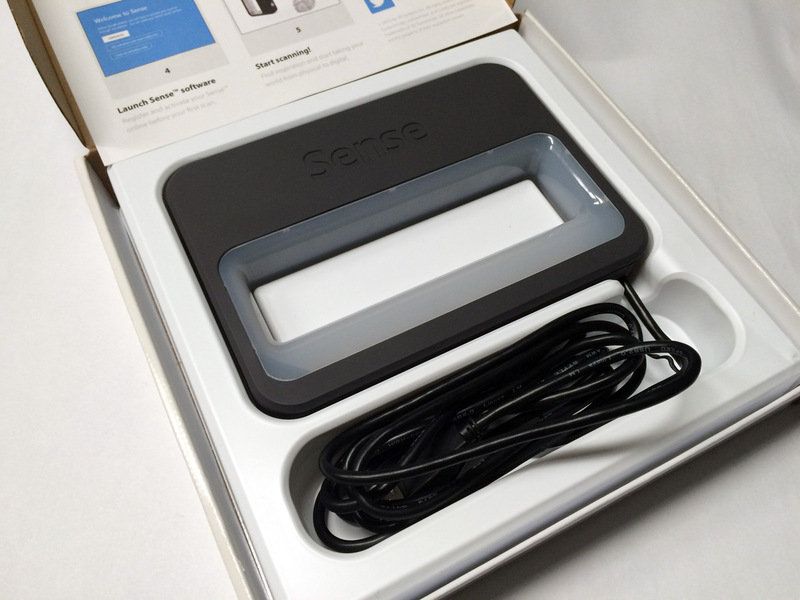 The Sense 3D scanner uses a 240×320 resolution for both the depth sensor as well as for the color image sensor. You can use the scanner with either a Windows PC or a Mac and a laptop is the preferred choice as you would need the scanner connected to the computer while you are scanning an object, especially if you need to scan something big. The scanner is equipped with a long USB cable that is a bit over 2 meters long, but you would still need to hold the scanner and laptop while scanning or have a person assisting you for larger objects as you would need to go around them for a full scan. You need to download the Sense 3D scanner software by registering the device and generating an activation code based on the serial number of the device, the software is not included with the scanner package. 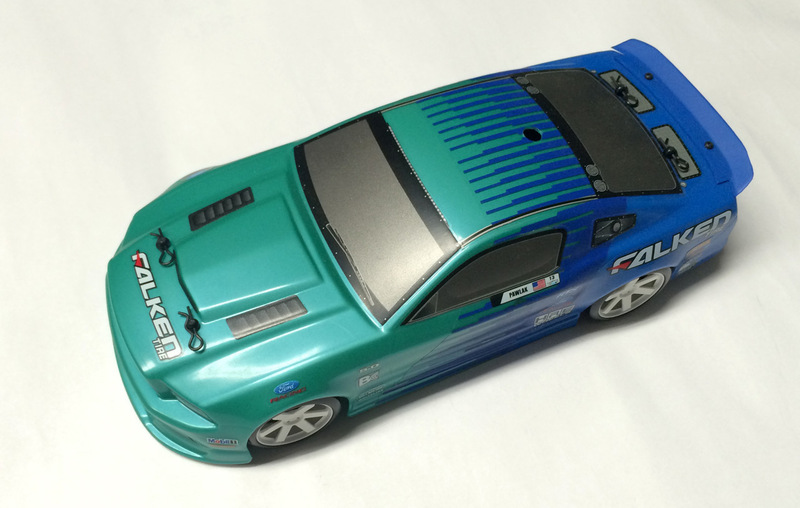 Here is what we have decided to scan, a 1/18 scale HPI 2013 Ford Mustang Micro RS4 Falken Drift RC car, after playing a bit with the software and experimenting scanning different things. As you can see we have decent light conditions and the remote controlled car is placed on a large piece of white paper to make the scanning process easier. You will need to play a bit with the software and scan various things in various conditions until you start getting the hang of things, so that you will be able to achieve the best possible results. The first time you scan something the results may end up quite disappointing, but that should not discourage you – try again and again and you will get better. The scanning software needs to you go around the object you want to scan carefully and slowly in order for the 3D scanner to build the mesh of the model as well as get enough data for the texture – it is a color 3D scanner, so you get a 3D model with a texture applied on it as an end result. 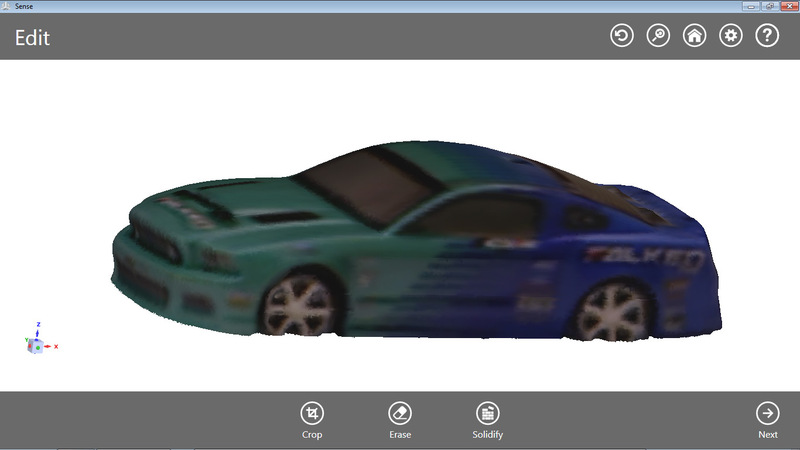 As you can see from our test scan of the remote controlled car above, a quite decent scape information with the texture not very clear – we remind you that the 3D scanner actually uses a low resolution image and depth sensors. After you finish scanning the object you get a shell with a texture applied, it is not a solid object that is ready to be 3D printers… there is a bit more work you need to do. You can Crop only a certain part of the image and Erase parts that you don’t need, this is needed only if there are some things that you don’t need aside from the object you scanned. Working in a well lit room with an even background such as white does help a lot not to have unneeded things apart from the object you are scanning. When you are ready you need to Solidify the scanned object and that process will make it a solid object that you can export and print. But before going to exporting or printing it you might have to do some more trimming to touching up the solidified object, though the trimming part is most likely the one you will need most of the time. Then you can export the finalized solid object in STL, PLY or OBJ file format, just be aware that the STL file format will not export the texture information. 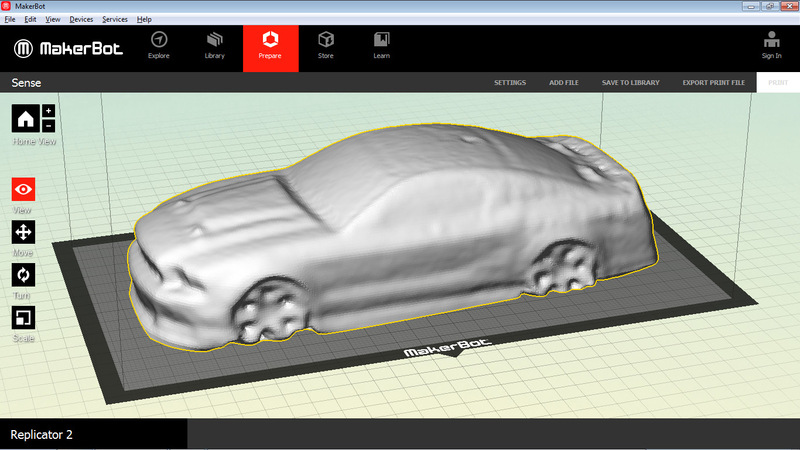 Here is how an STL model exported from our 3D scan looks like when imported in the MakerBot Desktop software. The result is pretty good, but some more work on the model mesh might help get even better results before actually printing it. Do note that the scanned object is imported as a solid, so the insides of the car are filled with material – this means a lot of material and time is needed to print the model in this form coming directly from the scanning software. You might want to make the insides of the scanned object hollow and use support material in order to save on material used as well as time required to print, especially if you want to get a larger size output like a 1:1 replica of what you have scanned. 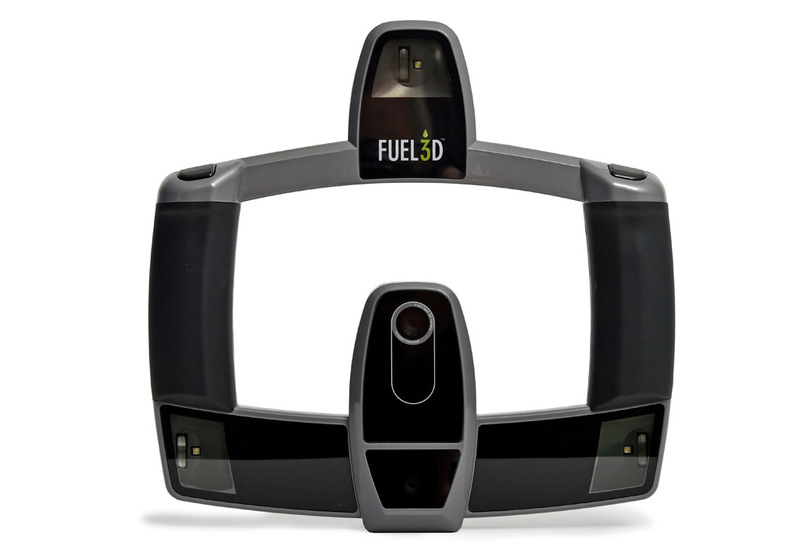 The 3D Systems Sense 3D scanner is an affordable and easy to be used device and it produces decent results once you get to play with it and get the hang of things to get the most out of the device. The software is intuitive and easy to be used, though it lacks some more advanced functions to make it easier to get better results, especially when fixing errors during the scan or improving the results after solidifying the scanned object. The color information that gets applied in the form of a texture on the scanned model may look nice as an idea, but the quality is not very good and you are probably not going to be needing it anyway when 3D printing the model anyway. The outline of the model gets scanned pretty well, the problem is in the finer details that usually don’t get that well represented in the resulting 3D model, the reason for that is again the lower resolution depth scanner. So if you need to be able to 3D scan with high quality model and texture data, then the Sense 3D scanner is not the right product for you. But if you want to get a good idea on how 3D scanning works and to be able to experiment with it without requiring too accurate results and very high detail levels and not investing too much in hardware, then the Sense 3D scanner might be a good choice.